RISO's success is partly built on its pedigree as a producer of specialist inks. Its founder began by mixing inks at his kitchen sink just after World War II, and its mastery of inks allowed it to develop its signature duplicators. These ultra-reliable machines use an ink-based cold process, and so consume remarkably little power - something that has always made them very attractive in remote areas, and in now in today's energy-deprived South Africa. The inkjet ComColor range has allowed RISO Africa to enter new industry sectors while continuing to dominate education, traditionally the backbone of its business. The printing industry, blue-chip corporates, publishers and training academies have all become key market segments... and RISO now holds 20% of the high-volume colour market. RISO's ComColor inkjet range has also been making waves in industry, particularly in the much-talked about sphere of Print-on-Demand, proving that print-on-demand is not only viable, but a cost-effective solution for schools, churches, corporate training departments and the like. Another industry benefiting from RISO's product offering is the publishing sector. 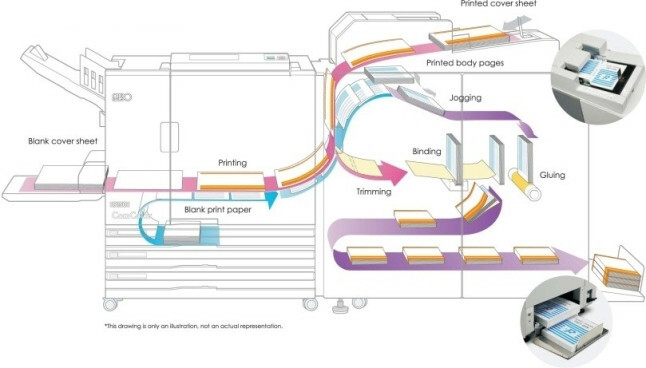 The ComColor 9150 coupled with the RISO Perfect Binder is able to print and perfect bind a full colour 600 page book in under 6 minutes, and makes short-run book printing simple and economic. RISO's "business colour" technology means that full-colour printing has also become much more affordable. Training colleges who have implemented this solution have been both surprised and enthused with the results. From a business point of view, a solid print-on-demand capability also allows users to avoid having to hold large stock inventories, thus reducing overheads and ultimately improving profitability. Energy - its unreliability and increasing cost - has become a major factor in South African business, and particularly affects businesses running manufacturing/ production processes involving large numbers of staff. Sonia Anderson, Marketing and Environmental Manager at Riso, comments that Riso machines have always been noted for low energy consumption, making them attractive when power is constrained and ideal for use with green power and energy saving strategies. As the recipient of the Eco Logic Award in 2013 for Energy Efficiency, with a runner-up place for innovation, RISO places much emphasis on the energy efficiency of its equipment. RISO is, again, a finalist in the Energy Efficiency category at the 2015 Eco Logic Awards. Their award-winning, energy star certified equipment has always boasted significant power savings over competitor equipment. Aside from the need for less power, Riso's cold printing technology also improves reliability and enables ultra-fast printing (up to 150 pages per minute), making it most suitable for high-volume, quick-turnaround jobs. Another factor which makes RISO a firm favourite is the high level of technical support provided. Not only do users receive operator training, but RISO's technical interventions continue to receive stellar ratings. Operating on a bespoke preventative maintenance strategy, technicians are able to make repairs before minor issues have a chance to cause major disruptions. This proactive strategy considerably reduces downtime and increases performance. RISO operates through an established network of authorised partners throughout South Africa and Africa. In order to maintain their high level of customer satisfaction, our partners' technicians undergo the same stringent training mechanisms as our in house technical department. RISO is proud to announce their new partnership with Cape Office in the Western Cape. Cape Office opened its doors in 1982, as the first authorised Xerox dealer in South Africa. The focus of this business has always been on building sustainable, long-term relationships with its clients, rather than on short-term profits. Director Edgar Ortelee, together with his son Marco (Managing Director and Head of Sales), regard Cape Office staff members as a close-knit team. "We follow an open-door policy here," explains Edgar. "Whether you are an existing client with a query, or a prospective client who is thinking of using our services, you are welcome to come around for a cup of coffee and a chat about your needs." In 2014 Cape Office opened its second branch in Century City under the leadership of Stuart Daniels. The branch has grown from strength to strength, adding several high profile clients to their portfolio. "Having presence in the Cape Town area has provided us with the opportunity to keep a close connection with our customers, ensuring our service remains the best in the industry whilst maintaining our reputation of honesty and integrity. We are proud to be associated with the RISO product and team, and look forward to the exciting opportunities ahead." Thanks to their outstanding industry track record, RISO Africa has granted Cape Office RISO Platinum Partner status. Anderson had the following to say about this appointment: "In order to qualify as a RISO Platinum Partner, partners must share the same vision, work ethic, and service levels as RISO's head office. Cape Office easily meets the criteria, which is why we are thrilled to have them on board. This means that Cape Office is now authorised to sell and service all RISO equipment, including the latest range of ComColor inkjet printer, to the same standards as RISO's headquarters in Johannesburg."